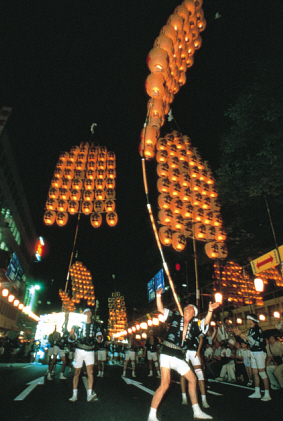 The Akita Kanto Festival (秋田竿燈まつり) is being held in Akita City, Akita Prefecture from August 3rd to 6th. 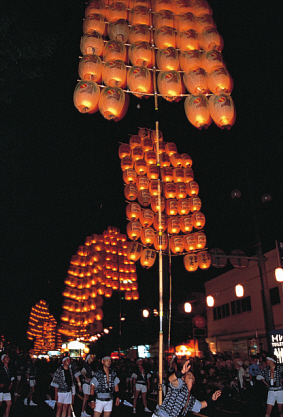 Kanto(竿燈) is a 10-meter-long bamboo pole with 40 lanterns. They weigh 50 kilograms. Kanto holders balance them on their foreheads, shoulders and hips. 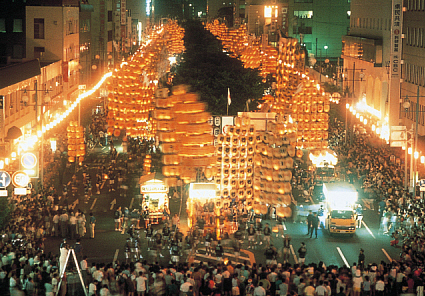 As with Nebuta festivals, this festival comes from a folk event to drive off the demon of drowsiness. An ancient literature written in 1789 described the folk event that people paraded along the street holding a long pole to which horizontal poles with lanterns were attached. The shape of kanto represents ears of rice and straw rice bags to pray for a good harvest.